Even though I’m an AFV modeler at heart (and an occasional sci-fi model builder), I have always wanted to do a ship, specifically a Uboat. I settled on the large 1/72nd scale Revell VIIC Uboat after reading many good revues on it. Additionally, I knew I didn’t want to simply build the boat to display on a static stand…It needed to be in a seascape diorama. If I didn’t have any experience building a boat, I had even less building a seascape. I was confident that I could parlay my knowledge of modeling AFVs into the ship build itself, but I needed to do some serious research on the seascape. I came across an amazing ship modeler by the name of Chris Flodberg and read as much as I could on his methods, both online and in the Weathering Magazine’s Water issue which featured Chris’s work. One of his methods appealed to me right away: his “oat bran” method which basically entails filling a shallow diorama frame with oat bran cereal, forming into a sea shape and fixing into position before finishing/painting. But at the last moment I saw a foam approach utilizing a dremel to shape the sea and since I was after a rougher looking ocean I changed tack (heh). I already had a dremel, so I picked up some 2” foam insulation board at our local home improvement store. Chris also suggested using a wood artist’s panel as the diorama base, and I ordered mine from the French Canvas company, custom sized to order. The rest as they say is history. The goal was to depict the sub as it was in the process of surfacing. For something so outside my comfort zone I am happy to say the process went quite smoothly. Chris’ method turned out to be fantastic, and he even granted me a few pointers along the way via email. I’m very happy with the results. The entire build process can be seen on my Instagram account @70skid. As for the ship itself, I opted for a few upgrades to the base model. These include: the Eduard PE set; Nautilus Models wood deck kit; EZline (heavy, black) rigging, and .5mm wire for the deck gun rope. All other parts are kit-supplied. 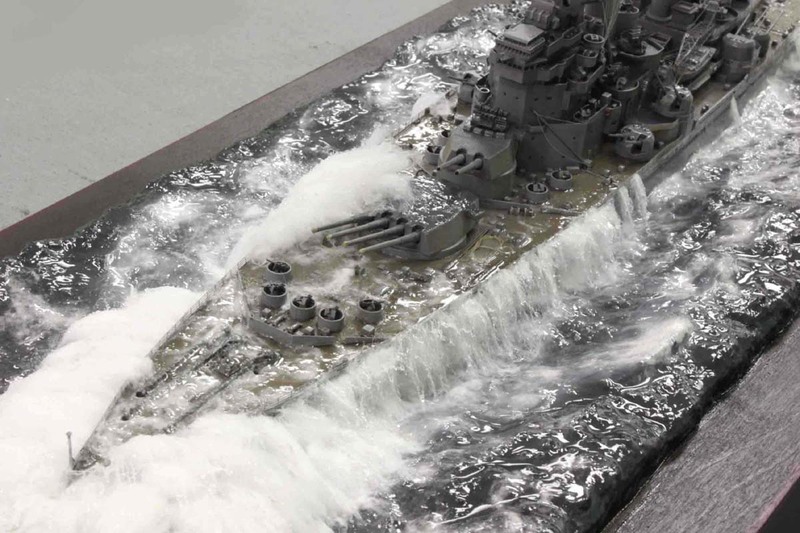 Hopefully Chris will stop by here again because I found one of his works at Model Warship that uses a very similar effect of water pouring off a battleship deck: Chris, if you see this, how did you model the streaming water? Cotton batting (rayon kind) attached first, then carefully brushed-on acrylic high gloss varnish (medium). I never ever use gel for any purpose when making my water. It looks awesome! Great details and beautiful water effect. The boat seems very dry though. Should it not by more gloss/wet? Thank you! Yes, I realize it's dry. It should be wet, of course. Sort of a balance between realism and artistic licenseâ€¦ Plus I finished the boat in pigments, and any finish I put over it alters their appearance or makes them disappear. I need to consider how I might go about adding a bit of wetness. Love this kit and the new Type-IX. Excellent build, though I also feel it could be wetter. Chris Flodberg is the master on water effects IMO. Thx very much! I should have mixed in a satin varnish at the outset!